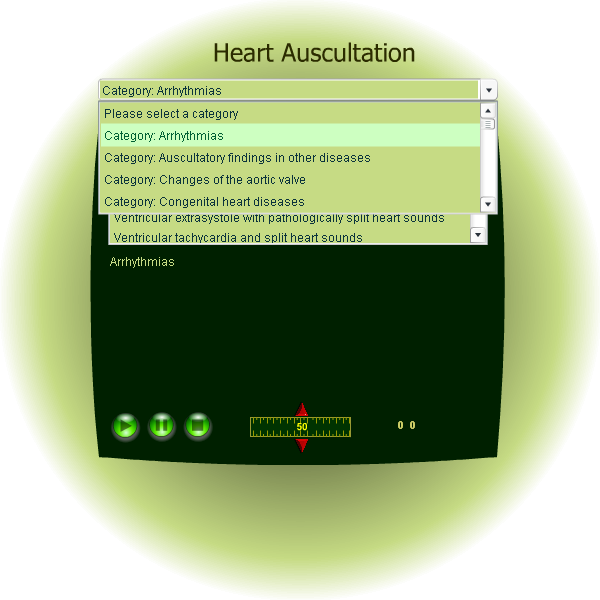 What does Heart Auscultation ™ offer? 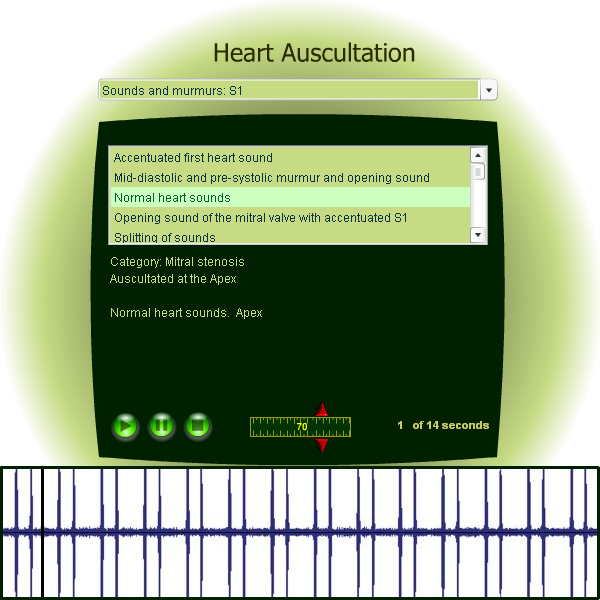 Heart Auscultation ™ offers in collaboration with USMLE Help™ hundreds of auscultation teaching files with heart sounds and heart murmurs. Normal heart sounds, Pathologic and adventitious heart sounds, Heart murmurs, Systolic murmurs, Diastolic murmurs, Early diastolic murmurs, Mid-diastolic murmurs, Pre-systolic murmurs, Holosystolic murmurs, Late-systolic murmurs, Mid-systolic murmurs, Continuous murmurs, Austin-Flint murmur, Machine-like murmur, S1, S1 splitting, S2, S2 splitting, S3, S4, Summation gallop, Quadruple gallop, Splitting of sounds, Ejection click, Aortic ejection click, Pulmonary ejection click, Pulmonary sound, 2nd aortic sound, Atrial sound, Mitral valve opening sound, Pre-systolic opening sound, Mid-systolic click, Auscultation at the 2nd left ICS, 2nd right ICS, 3rd left ICS, 3rd right ICS, 4th left ICS, Apex, Mesocardial region Neck, Arrhythmias, Extrasystole, Mitral regurgitation, Mitral stenosis, Changes of the aortic valve, Congenital heart diseases, Auscultatory findings in other diseases ... and much more! Heart diseases, valve disorders and other cardiac disorders are explained in detail. 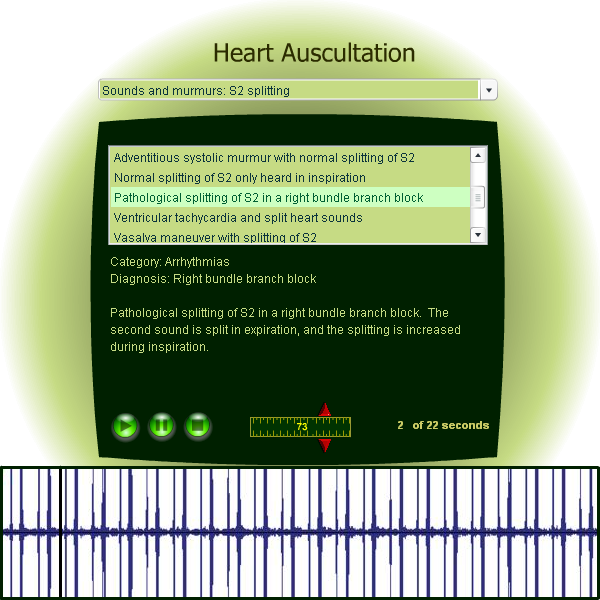 Multiple sound files are available for each entity (cardiac diseases, normal findings, etc.). Entity specific images enhance the learning experience by visualization of the cardiac cycle. A moving bar helps recognizing and following the heart sounds or heart murmurs. Control buttons allow you to change sound volume and pause at any time for indepth listening. 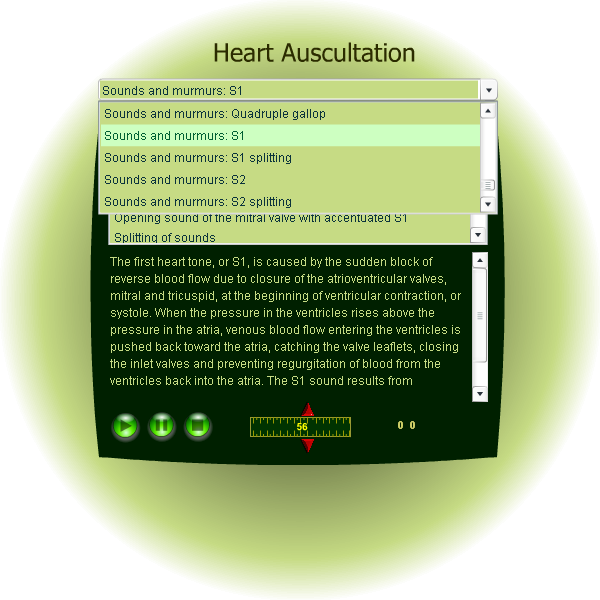 Sound file specific textual contents add additional information about diagnosis, location of auscultation and tidbits. 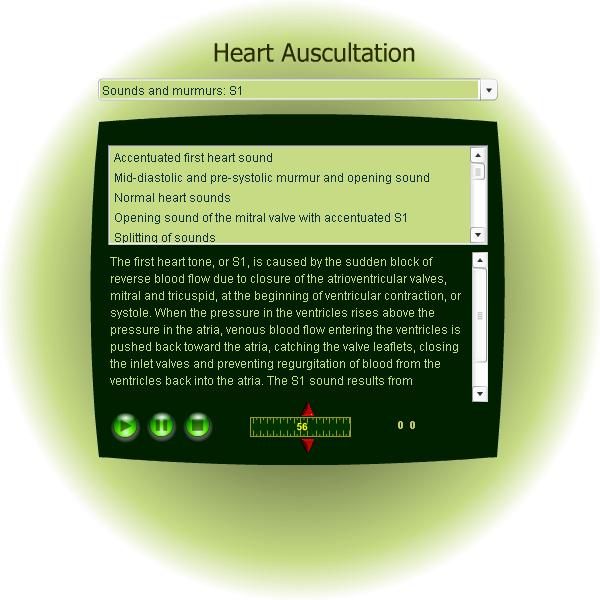 Try Heart Auscultation ™ today! Heart Auscultation ™ main page.